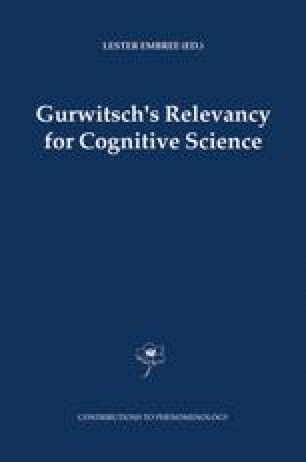 According to Gurwitsch, the body is at least in the margin of consciousness. If all components of the field of consciousness were experienced as equally salient, we would indeed not be able to think and behave appropriately. Though the body may become the focus of our conscious field when we are introspectively aware of it, it remains most of the time only in the background of consciousness. However, we may wonder if bodily states do really need to be conscious, even at the margin, or cannot be simply non-conscious. Action control requires permanent proprioceptive and visual feedback about the state and the position of our body parts. Experimental data shows that action monitoring operates at a non-conscious level and we may similarly suggest that we have a continuous unconscious access to bodily information. In this chapter, I thus intend to describe the various levels of body representations with the help of Gurwitsch’s distinction. I will investigate the properties and the function of each of these levels.